Many people consider window cleaning to be their least favorite of all cleaning tasks. That’s because some windows are hard to reach, some have tinting that requires extra special care, and almost all are nearly impossible to clean without leaving streaks or stains. But at Nancie Brown licensed window cleaning service Los Angeles, we love windows! We love windows because we have perfected the art of window cleaning. Whether your windows are large or small, tinted or not, residential, industrial, or commercial, Nancie Brown licensed window cleaning service Los Angeles has an expert process used to detail all types of glass that will leave them streak-free and sparkling. The window cleaning experts at Nancie Brown licensed window cleaning service Los Angeles know that this glass is one of the most expensive and visible features in your residential, industrial, or commercial building and we go to great lengths to protect these delicate and important assets. For other cleaning companies, windows are just one in a list of things they may claim to clean. Many of them, however, use the same soap and water solution on every type of glass, regardless of its thickness, coating, or location. And the glass is all they’ll clean. Nancie Brown licensed window cleaning service Los Angeles takes pride in staying abreast of all of the current innovations in window cleaning techniques and brings you window cleaning’s “best practices” to each job. No window is too high for our boom lifts and no glass is too complex for our team. With over 25 years in business, Nancie Brown licensed window cleaning service Los Angeles projects have included hospitals, schools, hotels, restaurants, office buildings, plus the finest homes and estates. Nancie Brown licensed window-cleaning service Los Angeles is a highly respected cleaning company whose services are in demand throughout Southern California, including Santa Barbara County. Much of our success is due to our dedicated and loyal core supervisorial staff, which averages almost 18 years of service. 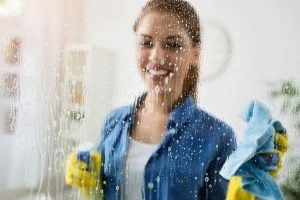 Each member of the Nancie Brown team is personally trained by Nancie Brown to ensure efficiency and consistency in all our cleaning assignments, particularly windows. We are fully licensed and credentialed, and insured. Nancie Brown & Assoc. is also a member of the American Society of Interior Designers (ASID). So whether you need expert cleaning for residential, industrial, or commercial windows, let Nancie Brown licensed window cleaning service Los Angeles give you the sparkling, streak-free windows every time. For more information about our licensed window cleaning service Los Angeles, contact our office today at (310) 837-7880.